Moniquirá is a municipality in the Colombian Department of Boyacá, part of the the subregion of the Ricaurte Province. "The municipality shall have its own flag, symbolizing the history of our small homeland. The flag shall be respected since it represents the culture and customs, and, in general, the feelings of the inhabitants of Moniquirá. The flag is made of three horizontal stripes, green, guava and white. White represents peace, tranquillity and purity of its people." 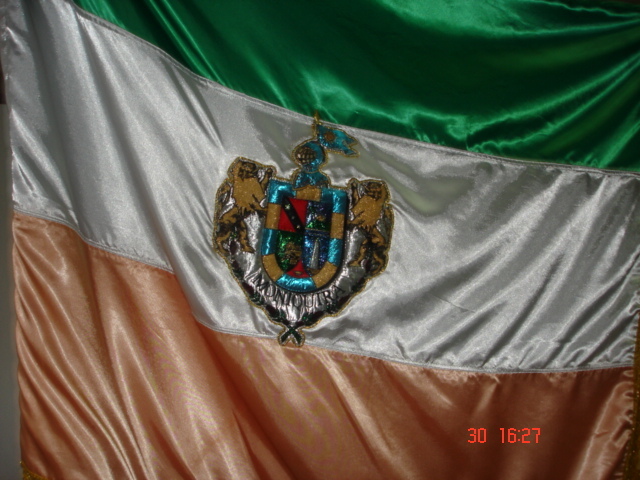 The photograph of the flag shows the stripes as arranged green-white-guave, with the coat of arms in the middle. "By Decree No. 018 of 1999, the municipal coat of arms of Moniquirá was adopted as the distinctive symbol and physic emblem of the Moniquirá territory. 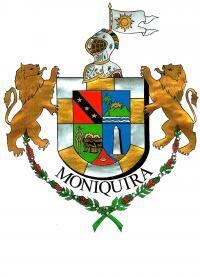 The coat of arms of Moniquirá is of Spanish shape, quartered by a cross with a triangular escutcheon in base. The border is compony of ten pieces, five or and five argent. The shield is surmonted by the helmet of the Grand Warrior, with, as the crest, a swallow-tailed flag charged with a sun. The supporters are two lions rampant surmonting coffee branches. IV. Azure an obelisk or. Escutcheon gules a copper miner's pan. I. On a red field, synonym of victory with blood shed, is shown a black bend with the three stars representing the rank of Captain Antonio Ricaurte**, a hero of the Granadine period born in the Province whose capital is Moniquirá. II. Represents the name of Moniquirá, in Chibcha "the Town of the Baths", above river Moniquirá, the palm plantation, the mountains, the sun and the celeste blue of the sky. III. On the green of its rural hamlets ("veredas"), the symbol of the farmers' work as the grinding of sugar cane*. IV. The obelisk as a symbol of confraternity, integrity and Bolivarian unity, made by Eduardo Malagón Bravo***. The escutcheon is charged by a copper miner's pan, symbolizing "Ciudad Dulce de Colombia", copper representing the mines of the municipality. The componed border represents the richness and integrity of the ten municipalities forming, together with Moniquirá, the Province of Ricaurte: Arcabuco, Santana, San José de Pare, Chitaraque, Togüí, Santa Sofía, Sutamarchán, Ráquira, Sáchica and Villa de Leyva, craddle of the great hero of San Mateo, Antonio Ricaurte**. The shield is surmonted by the helmet of the Grand Warrior, Antonio Ricaurte**, who shall live for the posterity and fly the flag of greatness, wisdom and glory. The two lions supporting the shield are the symbol of the strength of the inhabitants. The coffee branches with flowers and berries recall that Moniquirá is the first coffee producer in the Department of Boyacá." * a "trapiche" is a cog wheel used to grind sugarcane and ore.
** Antonio Ricaurte was born in Vila de Leyva in 1786 and died heroically in the battle of San Mateo, Venezuela in 1814. During the battle, Ricaurte immolated himself by lighting a barrel of gunpowder, killing a lot of Royalist soldiers and allowing Bolivar to regain control of the place and win the battle. Ricaurte's sacrific is recalled in the national anthem of Colombia: "Ricaurte in San Mateo, in atoms flying, 'Duty before life', with flames he wrote." *** Honorary member of the Magdalena Bolivarian Society, also the author of the municipal anthem of Moniquirá, of the flag and arms of Sutamarchan, of the modernization of the coat of arms of Santa Sofiá.